In recent years, Christians have shown an increased commitment to helping the poor. But this renewed interest in poverty alleviation is doomed to fail if it’s not rooted in the local church—God’s established means of drawing downtrodden people into a transformative relationship with himself. 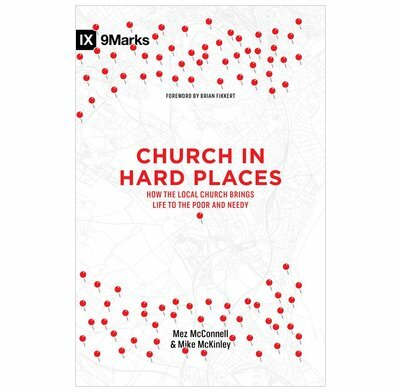 Emphasizing the priority of the gospel, Mez McConnell and Mike McKinley, both pastors with fruitful ministries among the poor, offer biblical guidelines and practical strategies for planting, revitalizing, and growing faithful churches in hard places—in your own community and around the world. Jesus came to seek and to save the lost, paying particular attention to the downtrodden and the poor. As followers of Jesus, Christians are called to imitate his example and reach out to those who have the least. This book offers biblical guidelines and practical strategies for reaching those on the margins of our society with the gospel of Jesus Christ. The authors—both pastors with years of experience ministering among the poor—set forth helpful “dos” and “don’ts” related to serving in the midst of less–affluent communities. Emphasizing the priority of the gospel as well as the importance of addressing issues of social justice, this volume will help pastors and other church leaders mobilize their people to plant churches and make an impact in “hard places”. Two pastors from opposite sides of the Atlantic come together to share their stories of pastoring people in hard places. Mike McKinley and Mez McConnell care about what the Bible says, they care about people, and they care about the local church. Their stories communicate love, joy, humor, and wisdom. I pray that this convincing and compelling book encourages others to labor for the spread of the gospel where today there is no witness. McConnell and McKinley have done us a great service in collaborating to write this accessible, passionate, and important book. Seldom have I read something with such a mixture of gospel ambition and hard-nosed realism. That’s probably because it is written by practitioners rather than theorists. May God grant a plethora of such practitioners to be birthed by this book for the vital task of reaching those neither easily nor often reached. Finally—a book on this vital aspect of the gospel mission that is Bible-rich, gospel-centered, and church-focused! And it’s written for the average Christian by two guys with skin in the game. Church in Hard Places is a gift to the church. As someone who is working in a hard place, I found this an encouraging and helpful read. There are some good and insightful applications to work in deprived areas. The writers are passionate about being faithful to the gospel and the Bible and the place of the local church. The biggest challenge for me was the cost of this type of ministry and the vision of raising up indigenous leaders from deprived areas. I looked forward to reading this book but found it disappointing. The authors say throughout the book that they don’t want to be critical of the community ministry many churches undertake in food banks, ministry to the homeless etc but they still were and they sadly make some rather arrogant statements. The authors fail to grasp, even in their own case, that God uses such acts of compassion for His glory and to reveal His presence in peoples lives. I had hoped to learn from these two pioneers but the book, sadly for me, was a missed opportunity to be a resource to help churches move people from accessing community ministry to worship.